You are here: Home / Dessert / Best Fudge Recipe Ever in 5 Minutes! 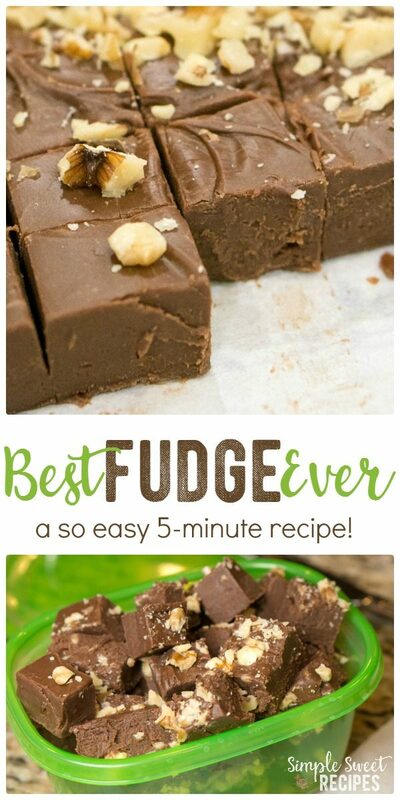 Best Fudge Recipe Ever in 5 Minutes! Decadent and sweet with a creamy texture. 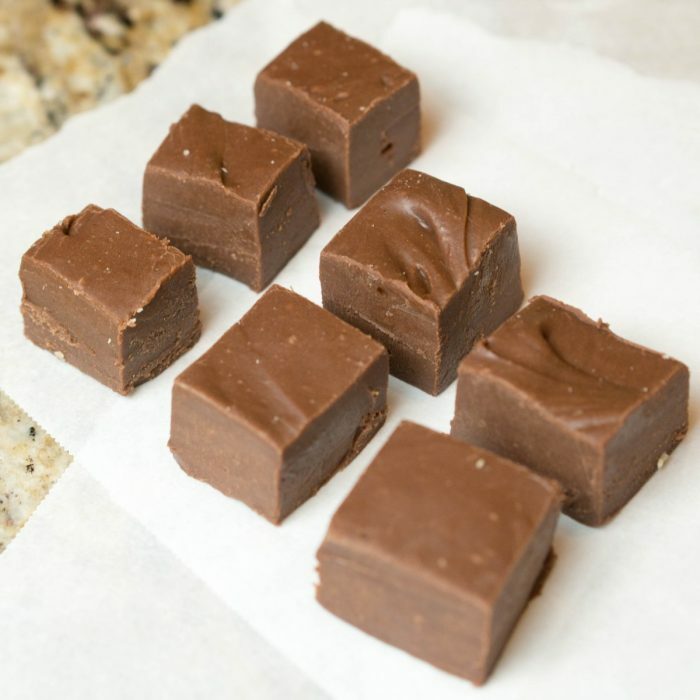 You’ll never make another fudge recipe again once you try this best fudge recipe ever that takes only 5 minutes! 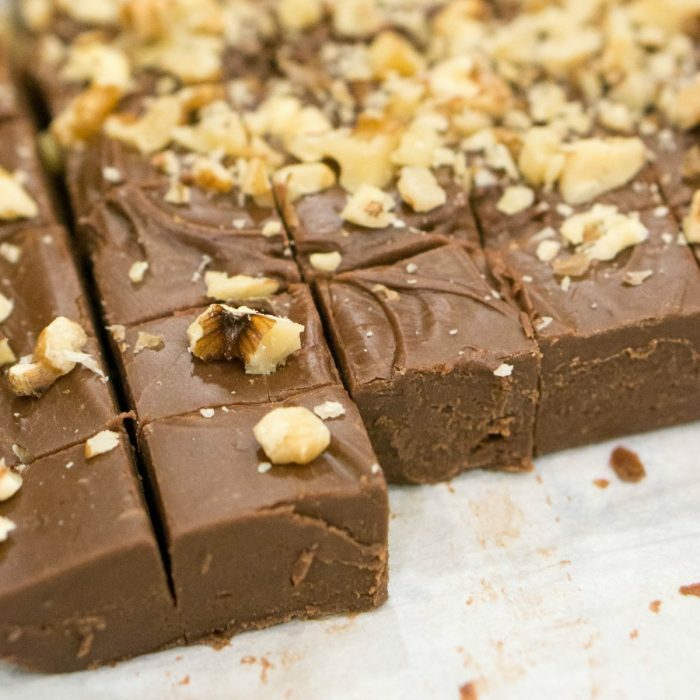 There’s just something so sinful and perfect about fudge. Especially one that takes only minutes to make. There’s a reason this is the best fudge recipe, because it’s so simple and yet so incredibly good. I love the creamy texture and smooth chocolaty taste. They combine just perfectly. And the marshmallows add that soft and creamy texture that makes this fudge so unique. Whether sprinkled with walnuts or left plain, it’s absolutely delicious. Sometimes, I’ll even hold off on adding the marshmallows for just a few seconds until the chocolate starts to cool so they won’t melt all the way. 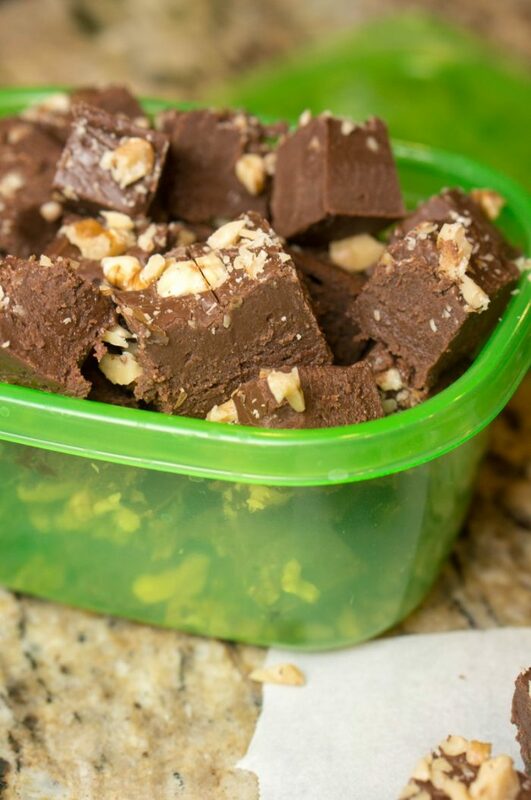 Instant rocky road fudge that is seriously the best!! With the sprinkling of chopped walnuts it almost reminds me of a bite of a snickers bar. 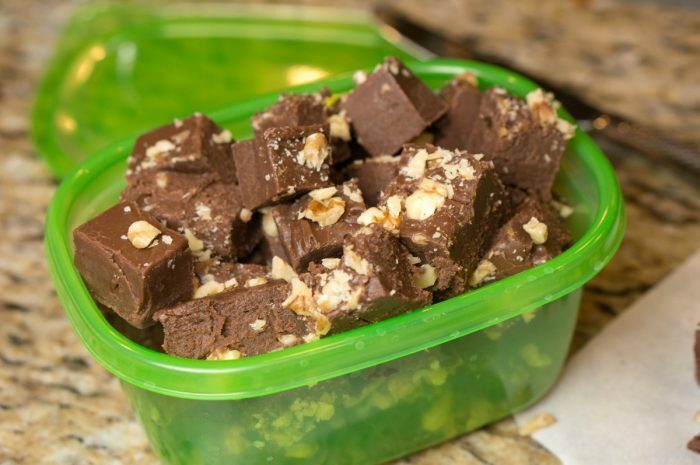 Just store your best fudge recipe sealed in an air tight container and it will be great for a couple of weeks! Or sort it out onto goody trays to share with friends and neighbors. 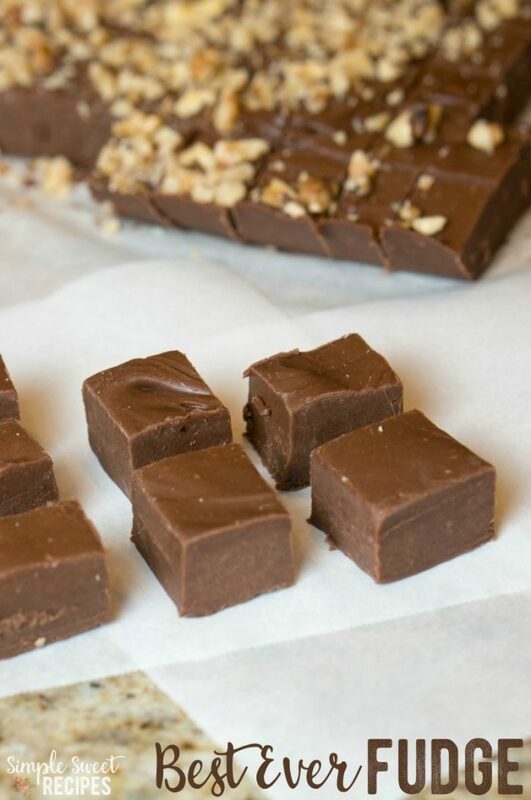 A single recipe makes a lot of fudge, so it’s great for those holiday goody plates. I usually dish up some super soft sugar cookies and this best ever fudge with a few caramels and it makes such a nice treat plate to bring to new neighbors, gatherings, or to pass out for Christmas. Combine chocolate chips and sweetened condensed milk in a microwave safe bowl. Stir to combine then cook for 1-3 minutes. Stir after each :30 second interval and be careful not to overcook your chocolate. Remove from microwave and stir quickly to combine until smooth. Add vanilla, nuts, and marshmallows. Line a 9x13 baking dish with parchment paper. Pour fudge into your lined pan. Allow the fudge to cool completely in the fridge until set. Cut into small squares and store in an air tight container in the fridge. This looks delicious! I only make fudge once a year because I love it TOO much! I like how simple your recipe seems to make. I love fudge! I’m going to have to try this out! I’m sure these would be great Valentine’s treats too! This looks simple and easy to make. Perfect for my tween daughter to try, she is really into cooking right now. 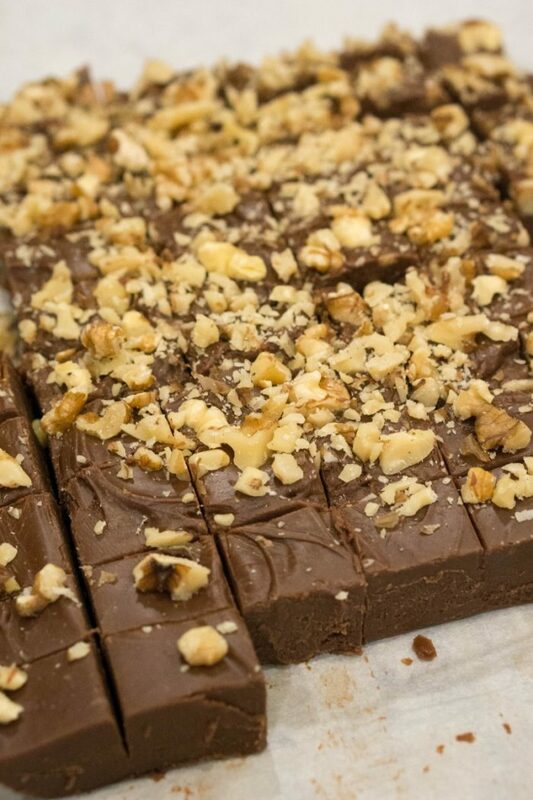 Your fudge looks AMAZING! I LOVE chocolate! Definitely need to give your recipe a try. Chocolate is a big weakness for me. I have a major sweet tooth. I like how your recipe is simple and easy to make. Yum! This fudge looks delicious. We have a long weekend this weekend so I’m going to take some time to make it! Hmm, marshmallows in fudge? I don’t recall ever using those in a fudge recipe! That looks amazing. Pinned to try. This looks double yummy! Thanks for linkin’ up with What’s Cooking Wednesday! Yes, 1 (14 oz) can. I updated the recipe so that was a little more clear. Try cooking your chocolate chips with the sweetened condensed milk in :30 second intervals, stirring between each. If you overcook chocolate chips, they turn stiff and grainy which will ruin the whole recipe. I’m wondering if you may have overcooked the chocolate? I just made this fudge again last week and added extra marshmallows once the mixture had just cooled (so the additional marshmallows wouldn’t melt) to make a “rocky road” fudge and it was as delicious and easy as always! Can you leave the marshmallows out? This recipe is best with the marshmallows, but you can leave them out in a pinch. Just made and could not get marshmallow s to melt. Chocolate was smooth but marshmallow s would not melt so when I put in pan marshmallow s made it lumpy..
You’ll need to add the mashrmallows immediately when you pull your chocolate out of the microwave while everything is still hot. If you add marshmallows when it’s started to cool, it’ll make a delicious rocky road fudge! Can I use bakers chocolate bar instead of chips? Going to try this today! Sounds great. Thank you! I JUST made this fudge but over a double boiler…the boiling water underneath the pan kept it warm enough to quickly melt the chocolate an marshmallows when I added them at the end.. I believe this is the key to this recipe. I just made this fudge. Very easy and it tastes just like the old hard to make fudge recipe. Just don’t over cook it. I haven’t tried the fudge without, so I can’t really speak to how their different. But if you get the marshmallows not-all-the-way melted they are super, super soft admid the already soft fudge. If you get them all the way melted then I think it just adds a creamy element to the fudge! I like mine not quite melted it feels like rocky road fudge! In the recipe it sounds like you add the nuts to the mixture but the pictures look like they are just on top which is if? Can you cook this on the stove instead I really don’t like to cook stuff in the microwave oven?